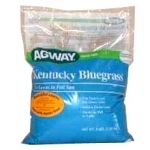 Agway Kentucky Bluegrass is a blend of three different bluegrass varieties. Annual bunchgrass. Shiny, dark green smooth leaves. Grows 2 to 3 feet tall. Major uses are mainly pasture although sometimes used for hay or silage. High nutritive quality. Seeding rate is 10 to 15 lb/A in mixtures, or 20 to 30 lb/A alone. September or early October are generally the best time to plant, but November overseeding of warm season grasses can be done along the Gulf Coast. Natural reseeding is common. Thrives in tall fescue lawns battling heat and drought. Heat Tolerant Blue spreads to repair your tall fescue lawn. Absorbs and releases water to keep seed moist - even if you miss a day of watering. Germinates faster than uncoated seed. No seed is more weed free - 99.99%. Grows 33% thicker per sq. ft. than ordinary tall fescue. Aggressively spreads to repair thin and bare spots. Stays green even in scorching heat and drought. Most cold tolerant grass. Performs well under high traffic, moderate shade and sunny areas. Absorbs and releases water to keep seed moist - even if you miss a day of watering. Germinates faster than uncoated seed. No seed is more weed free - 99.99%. Know as the highest quality turf for its deep emerald green color and soft velvet texture. Contains Scotts exclusive thermal Blue Kentucky Bluegrass. Aggressively spreads to repair thin and bare spots. Survives the scorching heat. A mixture of red fescue, improved kentucky bluegrass, kentucky bluegrass, and and improved perennial ryegrass developed by the University of Rhode Island.